The Tampa region sees travelers throughout the year, especially during the winter season. Florida beaches are known to be popular among tourists the world over and Tampa is no exception. For diverse travel requirements, there is our charter bus Tampa vehicles that come of use. Get your charter bus reserved today, call 813-514-6980! Whether one is planning to transport a private party or get a group around the region on an organized tour, there are varying charter bus rental Tampa vehicles that can be hired. The agency offers several 20 passenger mini buses which come of use for transporting corporate passengers. One can even opt to get one of the 30 passenger shuttle buses which can play regularly get school children to and from their homes. Our agency service is recognized and well established in the region. As a result, you can book your vehicle with us with complete ease of mind. The process of booking one of our 40 passenger charter buses is an easy one. One can log onto our portal and choose one of the several bus charter Tampa vehicles that are displayed. The rates and terms of hire are mentioned on the website. You can choose the right charter bus Tampa service and proceed accordingly. You will find the rates differ as per the requirement. 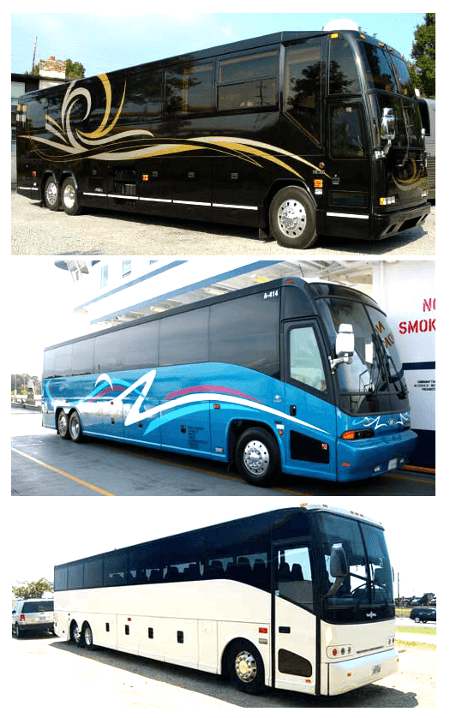 For multiple charter bus rental Tampa vehicles there are bulk rates applicable. For those who trying to book for several days, the daily rates will apply for the shuttle services. For more information call us at 813-514-6980! One other option of transportation is our exclusive Tampa party bus rental. Busch Gardens Tampa Bay; it is a popular amusement park in the area. Adventure Island; an outdoor park and water based activities are the prime attractions in this area. Lowry Park Zoo; interactive exhibits are popular in this zoo area. Big Cat Rescue; the wild cats in the sanctuary here provides a rare sight. Florida Aquarium; aquatic animals and sea creatures found here draw in the crowds throughout the year. The several attractions in and around the Tampa area are several for tourists the whole year round for which the charter buses are in demand among tour operators. The charter bus Tampa service we provide has shuttle services to and from the nearby airport. These shuttle rides are convenient if you are planning to catch a flight and need a cheap ride to the airport. Our limo service Tampa is the #1 means of airport transport. For private trips to other regions and cities like Safety Harbor, Oldsmar, Lutz, Largo, Dunedin, Lake Magdalene, Saint Petersburg, Brandon, Pinellas Park, Bloomingdale, you could opt for one of the 50 passenger charter buses we have. There are varying seating capacities provided which will ensure that charter bus rental Tampa service comes of use and is affordable and convenient for transporting groups from Tampa to other regions around the country.